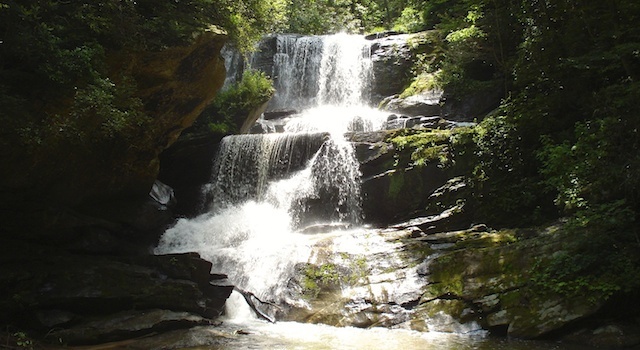 Hiking Highlights: Throughout the Little Bradley Falls hike you hear the sound of the flowing water of Cove Creek and numerous smaller creeks feeding into Cove. Tree canopy covers most of the trail to keep you cool in summer. Little Bradley Falls is a triple tiered, 50+ foot waterfall with a very nice volume of water flow during normal rainfall conditions. Absolutely beautiful! 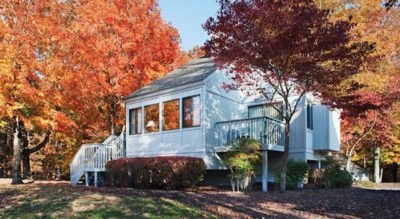 Map & Directions: Holbert Cove Road, Saluda, NC 28773. From the Lake Lure Beach – take US 64-E to NC 9-S. Travel 6.6 miles on 9 to turn right on Garret Rd. (small Lake Adger sign on Right and Red roof buildings on left) Follow Garret Rd. to end (1.3 miles) and turn right on Silver Creek Rd. Go 1.6 miles and turn left on Holbert Cove Rd. Drive 6.2 miles to dirt pull-off on right side of the road. Trail Challenges: 2 trail forks, 4 creek crossings, 1 boulder field crossing. When crossing the creeks I typically just wade on through with my waterproof Merrell Hiking Shoes. Or, you can rock hop, but be careful. Another option is taking your shoes off, wading across and putting your shoes back on when you get to the other side. Dog Friendly: Yes, however there are water and boulder crossing that you will need to take into account when determining if this hike is appropriate for your dog. Amenities: Roadside gravel parking is available. There are no restrooms or dog-related amenities. About the Hike to Little Bradley Falls: Once you have parked at the pull-off on the right side of Holbert Cove Rd., you need to walk back down the road, cross Cove Creek, then cross the road to the other side. You will then see the trail head. In the first 60 ft. of the trail you will notice it forks at a large tree. Head left along side the tree – not straight along the creek. As you ascend, the creek should be on your right and below you. Within a few hundred yards you will come to another fork in the trail. This time take the right fork down the ravine – not the left which curves around the ridge. No more trail tricks from here. Be prepared for creek crossings from here on out. 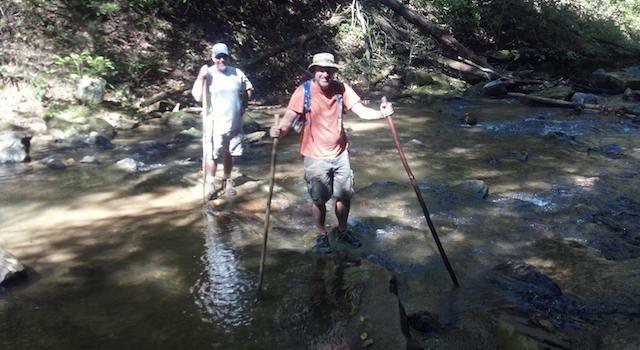 Rock hopping using a sturdy hiking stick can get most folks across without getting wet; however, the Cove Creek crossing may be a different story. Depending on water flow, you may need to wade across – no issues – sandy bottom, knee depth, slow moving but cold water. Following the Cove Creek crossing and a couple hundred yards of trail you will find the boulder field. Take it slow and you will have no trouble. See the pictures below for a look at some of the water crossings and boulder crossing. A little ways up on the left, you will see the remains of an old cabin. A little further, cross one more small creek and you will come up on a small camping area (camping is not supposed to be permitted). Stay on the trail to the left side of the camping area and you will see the beautiful Little Bradley Falls. Little Bradley Falls is magnificent! It’s a multi-tiered fall with an amazing water-flow and peaceful sound. There’s a rocky swimming like hole or lagoon style pool at the base of the fall which is perfect for cooling off during the hot Summer months. The sun glistens through the trees and casts beautiful beams of light on the waterfall which makes for some beautiful pictures. Once at Little Bradley Falls, you may get the hankerin’ to do a little climbing. If you attempt climbing to any of the tiers of the falls, be extremely careful. Each tier is more difficult than the one below it and people have been seriously hurt in the past. From Little Bradley Falls, you exit using the same trail that you came in on. Please leave as little evidence of your hike as possible so that others may enjoy this beautiful trail! 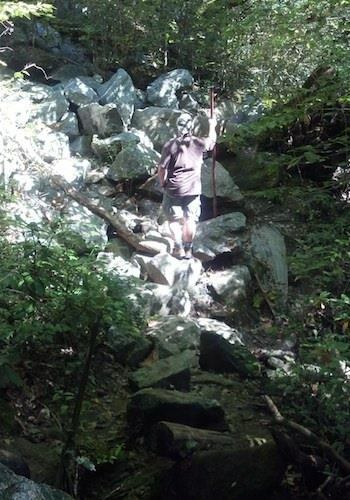 We hope you enjoy your hike to Little Bradley Falls which is just a short drive from Lake Lure, NC. 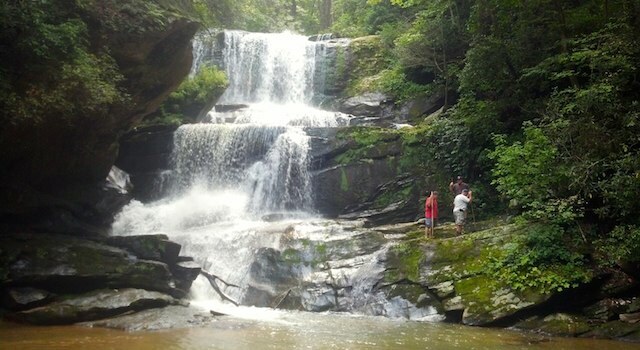 Be sure to visit nearby Big Bradley Falls for more waterfall fun!